von Briesen, Purtell & Roper, s.c. When does something officially become tradition? Milwaukee’s SUMMERFEST, “The World’s Largest Music Festival,” at year 51 is certainly a tradition. But, how about David Seebach’s “Wonders of Magic” celebrating 39 consecutive years of appearances at the festival? It’s important to remember that Seebach has changed the repertoire every year. So, what’s new for 2018? This curious prop was built for the magician way back in 1971 for performances at the University of Wisconsin-Milwaukee. It was featured in 1975 shows in Las Vegas and then stored away for decades. 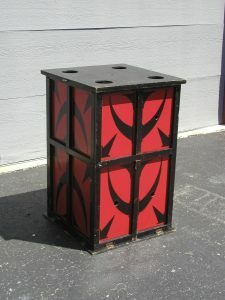 The photo was taken in 2010 before it was sent to Chicago to be refurbished and made ready for an appearance in Seebach’s annual Halloween attraction. So, unless you were in a UW-M audience in the early 70s, a Las Vegas crowd in ’75 or attended the one Halloween show where it appeared, you have never seen this illusion. But, you will at 2018’s Summerfest. Now, what will occur after a very attractive showgirl gets into that red-and-black cabinet? Seebach isn’t saying, only admitting that it’s the opening feature of this year’s series of shows. You can see for yourself on Wednesday, June 27th (6:30 & 8:30 pm); Friday, June 29th (7:30 pm); Saturday, June 30th (5:30 & 7:30 pm); Tuesday, July 3rd (7:30 pm) and Friday, July 6th (5:30 & 7:30 pm). This year’s edition, as always, has lots of opportunities for audience participation for both youngsters and adults. 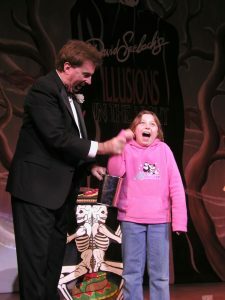 Seebach’s unique humor shines when he interacts with enthusiastic children and sometimes-nervous adults. A young woman will be invited to create a fantasy Summerfest experience. Will the magician be able to predict what band she’d most like to see and what she’d like to eat? With the help of a very young spectator Seebach will demonstrate a new —and magical— way to learn your ABCs. Two audience favorites are returning after absences of several years: a lesson on how to make money the magical way with four volunteers and the side-splitting transposition of a glass and a wine bottle that has become a ‘signature’ routine for David Seebach. Everything happens at the Northwestern Mutual Life stage adjacent to the children’s play area. Go to www.summerfest.com for more information.